There is a strict botanical definition of fruit, which famously includes tomatoes and cucumbers, while excluding things like apples and bananas. This is based on the structural properties of the plants that produce these objects. While useful for botanists, most people get by with a more human-use-oriented definition (or what Wikipedia calls a culinary definition). Fruit in this more general sense includes pretty much any part of a plant that is edible and tastes sweet, except perhaps for nectar, plus a few non-sweet rogues like lemons that get drafted in because they're otherwise similar to sweet things like oranges. Some people apparently even classify rhubarb as a culinary fruit in this sense, though I wouldn't go that far myself. Pretty much anything else seems to be fair game: apples, bananas, cherries, mangoes, strawberries, oranges, watermelons, peaches, pears, figs, lychees, and so on. For most people the working definition is really just, "I know fruit when I see it." There's really nothing wrong with that; you only get into trouble when speaking to botanists or pedants. Fruit has many uses. Many types of fruit come in convenient hand-sized packages that stay neat and tidy until you open them up to extract the sweet fruity goodness within. They can get battered around and mushed up in a school bag if you're not careful, resulting in that quintessential school kid experience of having all your books smell like rotting banana for a week. But a modicum of care is all that is needed, and your piece of fruit will stay edible and delicious until lunchtime. 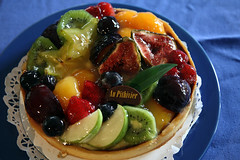 Fruit makes a great dessert. The sweetness of fruits makes them good for snacking on or finishing off a meal, when you need something other than savoury flavours on your palate. It also makes them good for cooking into desserts: apple pies, strawberry ice cream, banana cakes, and so on. Humans generally like sweet flavours. If you look at the natural world, rather than at the multitude of processed foods we have available today, that pretty much means fruit. Why is fruit so wonderful in all these ways? Well, it's not as if fruit is intended just for humans. It also turns out that fruit is good for a great number of animals too. For some species of monkeys, and apes like orangutans too, fruit forms a large majority of their diet. 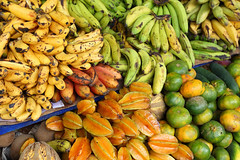 In the tropics where there is essentially no cold winter, trees grow year round and there is a continual parade of different fruits as different species of tree come into season at different times. A great many birds also eat fruit, as do non-primate mammals such as bats, rodents, ungulates, and others. Some reptiles will make a good meal of fruit, and even some tropical river fish if fruit happens to fall into the water. And then there are insects too. The secret of fruit lies in the fact that so many animals find it worth eating. Animals will often eat fruit whole, or in large chunks that preclude removing the fiddly seeds. Animals also move about, which is something that trees can't do. And they sometimes travel long distances in search of more fruit to eat. The seeds in a fruit are coated in a hard, protective covering. As long as the animal doesn't mash up the seeds by aggressive chewing, this can be enough to allow the seed to resist attack by the creature's digestive system. And in a day or so the seeds pass out the other end of the animal. The droppings are often deposited far from the place where the fruit was eaten, and so the seeds of the tree are spread far and wide, allowing new trees to grow away from their parent, and thus establish new territory. Fruit has another trick up its sleeve to ensure that this eating and dispersal of seeds happens when it's convenient for the tree. The seeds need time to grow and develop after the genetic material in the plant's ovaries is fertilised. If the seeds are removed too early, they will not be developed enough to germinate and grow into new plants. As the seeds develop inside, the fruit grows around them. The tree needs a method of preventing an animal from picking and eating the fruit too early. It does this in three different ways, that appeal to three different animal senses. Firstly, developing fruit is almost universally green in colour. From mangoes to oranges to peaches to berries of all sorts. If the seeds inside aren't ready to be removed from the tree, the fruit is green. This serves both to camouflage it from the searching eyes of fruit-hungry animals, and also more subtly as a signal to any animals that do see it, that the fruit is not yet ready to eat. When the seeds are ready, the fruit changes colour. It ripens. Ripe fruit is almost always a bright, conspicuous colour, easy to see against the backdrop of green leaves. Bright red, orange, yellow, or deep purple ranging into black - all colours that stand out against leaves. Animals with good eyesight, which includes mammals and birds, are attracted to the colourful, ripe fruit. Secondly, besides being green, unripe fruit usually tastes bad. The plant develops and grows the fruit using starches. It's only when the seeds are ready for dispersal that some of these starches are converted into sugars, causing the fruit to sweeten. Now, animals that would avoid the unripe fruit because of the taste, gleefully gobble down the sweet fruit. 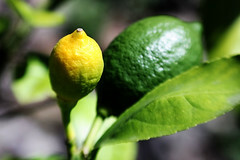 And thirdly, as the fruit ripens it begins to release a cocktail of complex chemicals. These are generally of the class of organic molecules called esters, with a few other things mixed in. These molecules can be detected in tiny, tiny quantities by animals because of the way they bind to receptors exposed to the air. These receptors are attached to the ends of nerves, which pass on the sensation to the animal's nervous system and brain. This chemical interaction we call smell. The molecules released by the fruit drift through the air on the breeze, sometimes for several kilometres, into the noses of animals. So far beyond the senses of sight and taste, the sense of smell can direct animals to ripe fruit. Fruit develops out of the ovaries and associated parts of a plant. The ovary starts life as part of a flower. Flowers are the reproductive organs of plants. They produce pollen, which is carried to other flowers either on the wind or by the actions of visiting animals such as bees. There are many, many animals who pollinate flowers, but that's a story for another day. Either way, when the pollen finds its way to another flower, it enters the ovary and fertilises the ovules inside. (Ovules are the plant equivalent of animal ova, or eggs.) These ovules will develop into the seeds that can mature and grow into new plants. The ovary that contains the ovules will develop into the fruit. A fig, a multiple fruit. That's the basic story, and the strict botanical definition of fruit. But as is often the case there are complications, modifications, and outright weird stuff that goes on in different plants. Some fruits are defined as accessory fruits. These are produced when the ovary forms only a part of the final overall fruit, and additional fleshy material is produced from other parts of the flower. 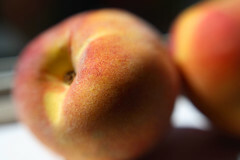 The most common examples are apples and pears, in which the relatively hard and less edible core is formed from the ovary, while the mass of tasty flesh around the core is the swollen flower tissue that originally surrounded the ovary, rather than the ovary itself. Some plants have more than one ovary in each flower. When these develop into fruits, the result is essentially several small fruits that are stuck together into what we consider a single fruit. Examples include raspberries and blackberries, each of which can be pulled apart into the tiny individual fruits if you're careful. These sorts of fruit are called aggregate fruits. A different complication occurs in plants that produce tight sprays of small flowers. These can produce individual fruits from their ovaries, which end up fused together into a single large fruit that was originally several separate flowers. A good example is a pineapple. Unlike the aggregate raspberry, you can't readily tell that a pineapple is made of separate components stuck together, but this origin is betrayed by the diamond pattern of the eyes and spikes on the skin. 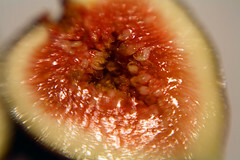 Another fruit of this sort is the common fig, which is in fact made of several flowers that originally grew inside an enclosing capsule on the fig tree. These sorts of fruits are called multiple fruits. 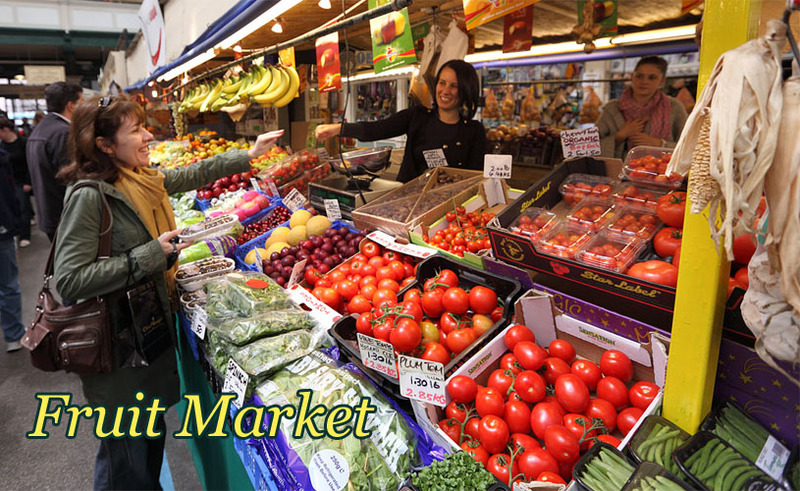 Many fruits are now of course grown commercially for human consumption. 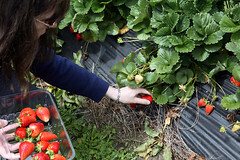 This has prompted growers to breed fruiting plants selectively, to emphasise desirable traits like fruit size, colour, taste, and—in some cases—reducing or eliminating the presence of seeds that we humans find annoying or difficult to pick out while eating. Possibly the most grossly modified fruit is the humble banana. You may already have pondered the fact that bananas have no seeds. This only applies to commercially cultivated bananas. The wild ancestor of the commercial banana has nasty, hard seeds that make the fruit difficult to eat. The banana you buy in a supermarket has no seeds. How then do the growers get new banana plants? Fortunately, banana plants can be propagated from cuttings or by root division. However, if humans were to be wiped out, the poor cultivated banana would probably have a only very short time before it too died off. So fruit is not only yummy and good for you, it's a portable reminder of how marvellous the natural world is. Its many forms are adapted through the processes of biology to assist plants in propagating themselves by recruiting animals to transport their seeds. Next time you pick up a piece of fruit, take the time to examine it carefully. Admire the colour. Sniff it with your eyes closed and imagine you are in a forest, looking for something good to eat. Then sink your teeth in and enjoy the sweet flavour. There are the so-called "walking trees" of the Amazon rainforest, which stand on a splayed spread of stilt roots. Legend has it that the tree is capable of sprouting new roots preferentially on one side and letting roots on the other side die off, resulting in the tree slowly moving through the forest. There appear to be no substantiated cases of this actually happening, however. There are some fruits that stay green. But try and name some, and you'll very soon run out. Last Modified: Sunday, 19 January 2014; 00:10:44 PST.